One of the most important lessons for me in 2014 is the quest to keep pushing myself out of my culinary comfort zone. Cooking and baking with unfamiliar techniques, ingredients, and equipment forced me to learn many new and wonderful things. ‘Tis the season for resolution so I resolve to continue trying something new in the kitchen at least once every week in 2015. I did not waste any time and quickly found not one, but two fun things to learn. In Chinese cooking, smoking food with tea is a classic cooking technique. Unfortunately for me, the prospect of setting up a smoker indoor sounds more than daunting. Turns out, it is rather simple and clean up is a breeze. Why did I wait so long to learn? 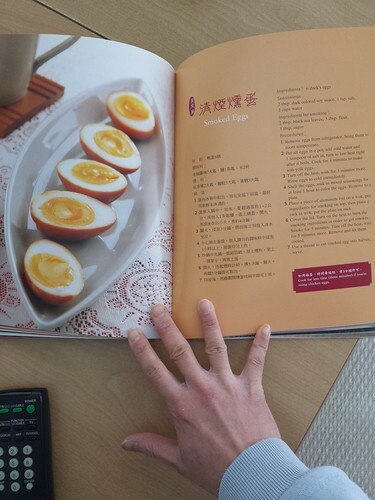 Thank you Angela Ching and her well-written recipes to demystify this cooking technique. 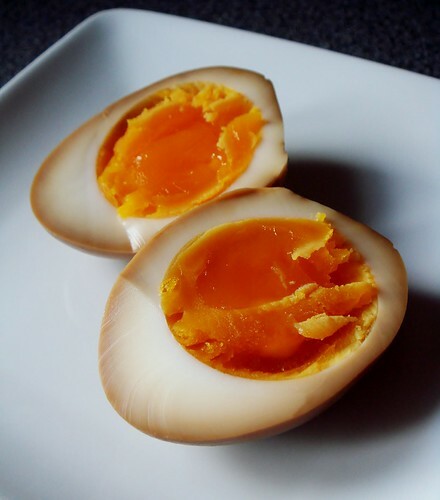 The simplest thing to smoke is none other than soft boiled eggs. Eggs absorb infusion of flavour very quickly. Coincidentally, it is one of my favourite things to eat! Soak eggs in soy sauce brine overnight to take on some colour. Line a frying pan or wok with large piece of foil. 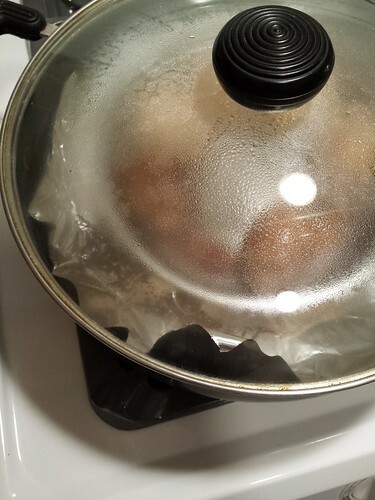 Place flour, brown sugar, and tea leaves on foil. 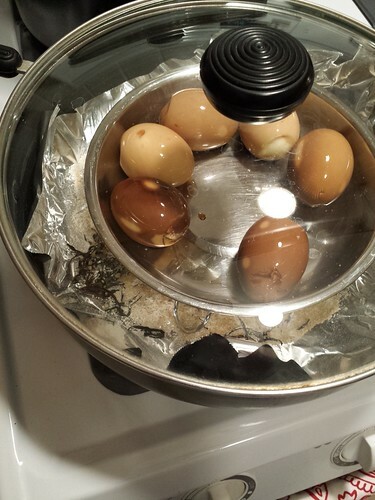 Place a steaming rack and a plate containing drained eggs in prepared pan. Cover with lid. Cook over high heat until smoke fills the pan. Smoke for 5 minutes and turn heat down to low for another 5 minutes. That’s it! It was a little scary to watch smoke wafting from the mix of flour, sugar, and tea leaves. Under normal circumstances, that is precursor to a blackened pan of burnt food! It took a lot of self-control not to freak out. I was amazed how harnessing the smoke could make something delicious instead. 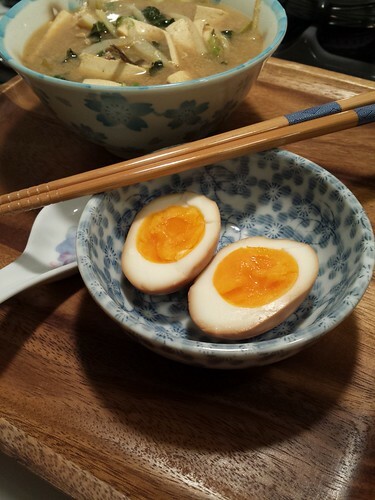 The soft boiled eggs took on a subtle smoky taste to complement the slightly runny yolk. What a treat! Clean up was a breeze. The burnt bits stayed on the foil and easily discarded. 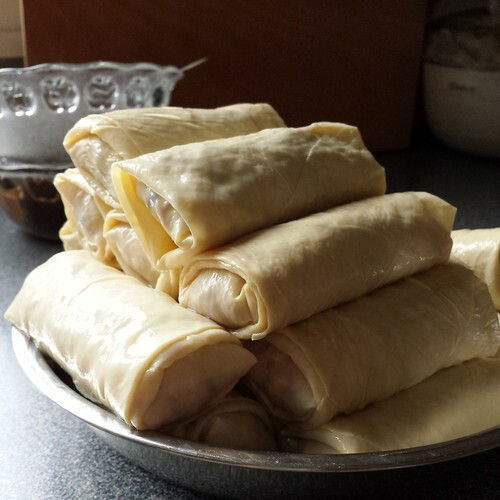 I have a soft spot for bean curd rolls because they were my mother’s specialty. I never learn to make it and I regret it since. This is a mainstay in dim sum restaurants, either steamed or fried. Alas, they just never taste like home. Although I cannot recreate this taste memory, a homemade version is certainly within my reach. I purchased a stack of paper-thin frozen bean curd and slowly defrosted them in the fridge. Just before using, I heat up a large pot of water with a bit of baking soda thrown in. Working in stack of five sheets, I submerged the bean curd in hot water until they turned creamy white. I immediately fished them out and shocked in cold water. As for filling, it was a simple mixture of pork, shiitake mushroom, dried shrimps, bamboo shoots, ginger, and scallions. Not terribly different from typical dumpling filling, right? 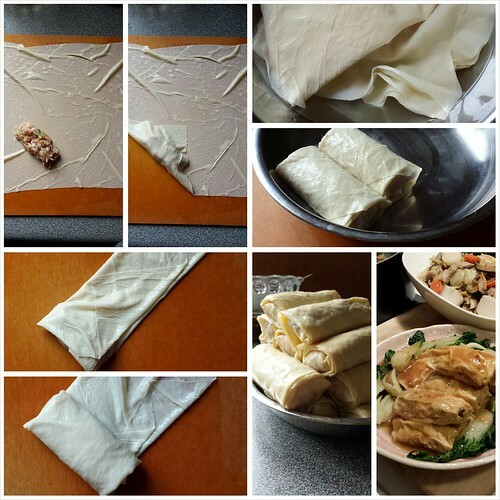 I was careful not to tear the delicate wrapping and made little pork rolls with bean curd. You can see how I did it in the following photo. 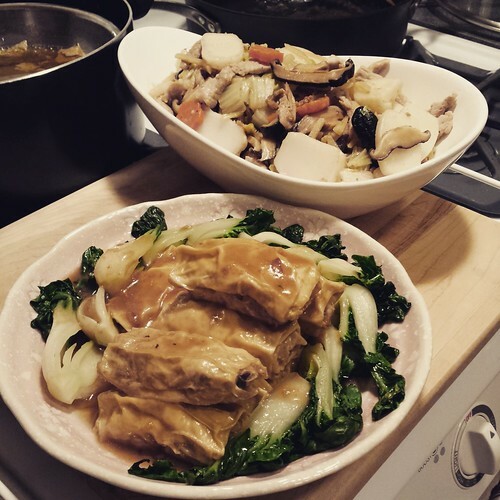 To cook the bean curd rolls, I lined a plate with nappa cabbage leaves and filled it with rolls. I drizzled a bit of sauce soy and water over the rolls and steamed on high heat for 20 minutes until the pork was cooked. Just before serving, I made a cornstarch-thickened sauce of chicken stock, sesame oil, and soy sauce to pour all over the rolls. What a simple and satisfying home-cooked dinner!